With enormous natural gas reserves and renewables potential, Iran has little need for nuclear power, and even less for uranium enrichment. If Iran's sacrifices in pursuit of its nuclear program cannot be explained by a gap in its energy mix, what will motivate its leaders to abide by the current nuclear deal? The coverage of the recently agreed international nuclear framework for Iran's nuclear program has missed an important aspect of the story. Nearly all of the reporting and analysis I have read considered the deal from a security and geopolitical perspective, without examining the merits of civilian nuclear power within Iran's domestic energy mix. That goes to the heart of Iran's motivation for future adherence to the terms of the detailed agreement that must shortly follow the broad framework negotiated in Switzerland. "Iran makes an unusual candidate for civilian nuclear power, compared to other countries with nuclear power. Most of these fall into either of two categories: those that lack other energy resources to support their economies, such as France, Japan and South Korea, and resource-rich countries that developed nuclear power as a consequence of their pursuit of nuclear weapons, including the US, former USSR, UK, and arguably China. Blessed as it is with hydrocarbon reserves, Iran does not fall into the former category, and it claims not to fall into the latter. Does it represent a unique case?" In the years since I wrote that, we've seen a growing interest in nuclear energy elsewhere in the Middle East, including a reported memorandum of understanding between Saudi Arabia and Korea for constructing civilian power reactors in the Kingdom. Such projects in energy-rich Gulf States beg the same questions as in Iran, although the "displacement of oil for export" rationale holds up better for Saudi Arabia and the UAE than for Iran under the current circumstances. Moreover, since 2005 the cost of building nuclear power plants has increased, in some cases significantly, while the cost of natural gas-fired combined cycle turbine power plants has generally declined, thanks to substantial efficiency improvements. For that matter, the cost of alternatives like solar power, which Iran's geography favors, has declined even more in the interim. A decade after I first examined this question, it is still hard to find a compelling energy rationale for Iran to pursue civilian nuclear power with the persistence it has demonstrated. Developing more of its abundant natural gas would be more cost-effective, perhaps in combination with solar power, which presents natural synergies with gas relating to solar's intermittency. These options would not have triggered the kind of economic constraints to which Iran's choices have led. Nor does the other rationale to which I alluded above withstand scrutiny in this case, involving the application of domestic nuclear power to free up for export oil and gas that would otherwise be consumed to generate electricity. The implied cost of Iranian gas displaced from power generation would likely be higher than the cost of new gas development, especially when the costs of the full nuclear fuel cycle that is the crux of international concerns are included. If anything, Iran's pursuit of nuclear energy in the last decade has functioned as a reverse fuel displacement mechanism, resulting in costly reductions in oil exports due to international sanctions. As for the benefits of nuclear energy in cutting greenhouse gas emissions, Iran did not include nuclear power in the list of mitigation measures it presented at the UN climate summit in Durban in 2011, nor did it commit to specific emissions reductions at the Cancun Climate Conference in 2012. On balance, Iran's objective need for civilian nuclear power scarcely justifies the sacrifices it has endured, or the lengths to which it has gone to secure its nuclear program. Over the last 10 years, buying time through engagement and negotiations led to an opportunity for the "P5 +1" countries to impose the tough sanctions that brought Iran to the point of the current deal, once rising US shale oil production effectively defused Iran's "oil weapon." However, if the current agreement merely buys more time, it risks squandering the best chance to bell this cat. We cannot count on having more slack in energy markets 10 years hence than we do today. Viewed from an energy perspective, the primary purpose of Iran's nuclear program seems unlikely to be an expanded energy supply, rather than a weapons capability. In that context, the concerns about this deal recently expressed by two former US Secretaries of State who negotiated Cold War arms control agreements with the Soviet Union should be sobering. They deserve serious consideration by both the White House and a Congress that seeks its own opportunity to weigh in. How Will Low Oil Prices Affect Natural Gas? The growth of US natural gas output in recent years has been sustained partly by gas produced in conjunction with shale or "tight" oil. The slowdown in oil drilling in response to lower oil prices could also affect future natural gas production, and thus prices, especially in the US. Media coverage of energy has focused heavily on oil prices, lately, for understandable reasons. Oil's dramatic plunge and subsequent volatility would be newsworthy, even if petroleum weren't still our leading source of energy, especially for transportation. In this context, the dog that hasn't barked is natural gas, although oil and gas are still linked by common drilling hardware and often produced from the same wells. With oil drilling being curtailed in response to low oil prices, should we be concerned about natural gas supplies in the months and years ahead? At first glance the answer ought to be a straightforward "no." As most people now know, US drillers figured out how to tap the country's vast shale gas resources economically. US gas production is at record levels, after rising steadily since 2006 and surpassing former top producer Russia around 2009. US natural gas inventories were severely depleted following last year's "Polar Vortex" winter, but output grew fast enough to keep the benchmark price of gas below $4 per million BTUs this winter, despite below-average temperatures east of the Mississippi. However, in assessing gas supply under low oil prices we must factor in the industry's response to the natural gas price collapse in 2008. The prices of oil and gas both dropped precipitously during the financial crisis, but gas didn't recover to the same extent as oil. In 2007 the average spot price of natural gas on an energy equivalent basis was just over half that of West Texas Intermediate crude (WTI). By 2010 gas was worth only a third as much as oil, and by 2012 just 17%--the equivalent of $16 per barrel in a world of $100 oil. Drillers responded accordingly. As the Energy Information Administration (EIA) chart below depicts, drilling for gas fell sharply from 2009-12, while "oil-directed drilling" rose just as sharply. In fact, these were mainly the same rigs, redeployed to pursue different targets--sometimes in the same shale basin--as gas grew cheaper. 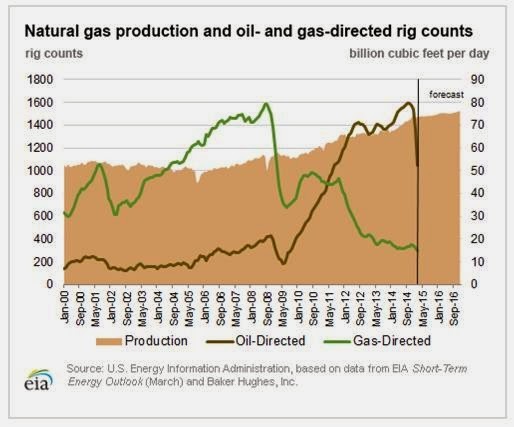 So shouldn't natural gas production have fallen in tandem with the decline in rigs drilling for gas? The extremely useful charts in the EIA's latest Drilling Productivity Report help to explain why gas output continued to climb. First, just as the increasing productivity of shale oil drilling has confounded expectations about how soon US shale oil production would begin to decline after prices fell below $50 per barrel, shale gas drilling productivity improved rapidly following the gas price collapse. For example, between 2009 and 2012 average gas production per rig--not per well--in the mainly gas-yielding Marcellus Shale more than tripled. From 2012 -14 it doubled again. Those gains reflect the combination of improvements in drilling efficiency (more wells or more feet drilled per month), improvements in hydraulic fracturing effectiveness, and companies targeting more productive well sites as knowledge of the basin's geology increased. A key development following the gas price collapse was the growth of gas production from wells drilled in pursuit of shale oil. The best example of this is in the Eagle Ford Shale in Texas. While oil production there grew from virtually nothing to over 1.7 million bbl/day, the region's gas output nearly quadrupled, to 7.5 billion cubic feet (BCF) per day, or 10% of total US gas production. Now we've entered a new chapter, due to a global oil surplus. As of the latest drilling rig count from Baker Hughes, oil-directed rigs employed in the US have fallen by around 45% since November 2014, and gas-directed rigs are down by a quarter. A few companies may have shifted from oil back to gas, but the overall rig trend is still down for both. The net result is that the EIA expects oil production from the major US shale basins to remain essentially flat from March to April, while gas production should still grow by about 0.3%. How much farther would US shale oil and gas drilling have to contract before lower rig counts swamped productivity improvements for gas? Comparing those figures to the growth rates in previous months, perhaps not very much. Of course the US represents only about a fifth of the global gas market. Elsewhere, especially in Europe and Asia, many gas sales contracts are pegged to oil prices, while supply is dominated not by flexible shale, but by large conventional gas fields and the trade in liquefied natural gas (LNG). So outside the US, lower oil prices may do more to stimulate gas demand than to shrink supply. Cheaper gas imports into China are apparently already having an impact on coal consumption. That could create new opportunities for companies developing LNG facilities to export US gas, at the same time that the economics of such exports become more challenging. In markets like Asia, the effect of lower oil prices has cut the gap between landed LNG prices and US pipeline gas--and hence the motivation for exports--by more than half. Even after oil's collapse, US natural gas at the Henry Hub has recently traded at about one-third of the price of WTI, per-BTU of energy. The contraction of drilling in response to low oil prices may tighten supplies and nudge the prices of both commodities higher, reminding us that gas isn't entirely immune to oil's influence. However, with US gas inventories ample, the market doesn't seem to anticipate either a spike in gas prices this summer, or a narrowing of gas's discount vs. oil any time soon.